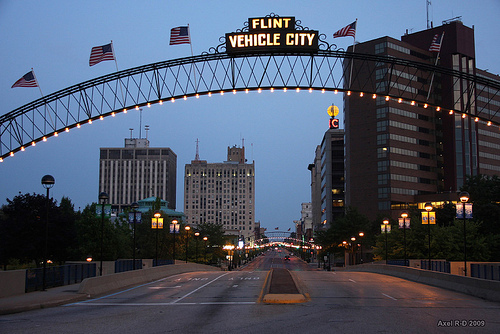 Flint, like seemingly every other troubled city in America, seems to be on a quest for "vibrancy." Thomas Frank doesn't mention the Vehicle City in his recent essay in The Baffler, but he describes the wants and aspirations of Flint's movers and shakers perfectly. Every city is either vibrant these days or is working on a plan to attain vibrancy soon. The reason is simple: a city isn’t successful— isn’t even a city, really—unless it can lay claim to being “vibrant.” Vibrancy is so universally desirable, so totemic in its powers, that even though we aren’t sure what the word means, we know the quality it designates must be cultivated. The vibrant, we believe, is what makes certain cities flourish. The absence of vibrancy, by contrast, is what allows the diseases of depopulation and blight to set in. This formulation sounded ridiculous to me when I first encountered it. Whatever the word meant, “vibrancy” was surely an outcome of civic prosperity, not its cause. Putting it the other way round was like reasoning that, since sidewalks get wet when it rains, we can encourage rainfall by wetting the sidewalks. But to others, the vibrancy mantra is profoundly persuasive. The problem is that no really seems to know if spending money to turn downtown Flint into a destination spot with restaurants, bars, art walks, music venues, and a variety of other cultural activities will actually work. But as Frank points out, that isn't stopping civic leaders and big-money foundations from pursuing it wholeheartedly. My target here is not their power, but their vacuity. Our leadership class looks out over the trashed and looted landscape of the American city, and they solemnly declare that salvation lies in an almost meaningless buzzword— that if we chant that buzzword loud enough and often enough, our troubles are over. The worry, of course, is that the latest urban planning trend is just another futile attempt to combat fundamental economic and societal problems that artwalks and farmers' markets won't solve. But it's also true that some cities *do* come back from being socially dysfunctional and economic wrecks to being "vibrant"...whatever that means...and successful. I don't think very many people believe such comebacks happen randomly or other than in response to some controllable factor. Perhaps it's true that our present leaders and experts don't know what they're doing, and are spending money wastefully or wishfully. We can't very well just fire them, though. It's obvious that if we do nothing, we won't get anywhere. So how do we decide who to replace them with? Mr. Frank's premise will be a hard sell as long as he, too, can't explain the magic involved. Name that comeback city, one that has sunk to near-Flint level depths. NYC under Guiliani doesn't cut it. Whatever it is, craft beer houses, and college kids weren't the cure-all. One of Frank's points is that most of the methods tried in KC (and hence Flint) are for the benefit of a small class who is already doing just fine. 98% of Flint is it's neighborhoods. A good chunk of Uptowners and their target market don't live in Flint. Moving the Farmer's Market is great for the Uptown folks, but it is just one more example of centripetal force- as downtown "bangs" (you can't really call it "booming") the neighborhoods become exponentially more distressed. Mr. Frank is fundamentally wrong about competition to attract businesses being a bad idea. Leaders who convince businesses to come to the locale for which those leaders are responsible bring that locale more jobs and a better prospect for happy, successful lives for its residents. To a great extent, locales *want* their leaders to accomplish things that improve the local economic future. His sole focus on selective "artyness" encouragement misses the point that effective business attraction also requires other initiatives...encouragement of other-than-retail business formation, encouragement of graduate-level education in business, sciences and technology, parks-and-recreation opportunities, ample policing, infrastructure maintenance and improvements...and that by and large, leaders recognize this need for a multi-front effort and pursue those other needs to the best of their locale's abilities. In the end, he just doesn't like the word "vibrancy". Fine, thank you for the input, but we have an economic future to manage. His analysis that locale-vs-locale competition to attract job-creating businesses amounts to pandering to a class of people who have money or have prospects of eventually having money is a bad idea, and local leaders should just trust their locale's economic future to luck or fate, is absurd unless everyone stops competing all at once...and that's not going to happen. So, let's get back to the work of trying to make *our* locale more attractive to businesses, including efforts to promote "vibrancy" when we can. I'm no expert at this...Dan Kildee would be a good person to ask, or maybe a city-planner-type affiliated with the Mott Foundations, or perhaps an academic focused on urban psycho/socioeconomics...but Youngstown, Ohio comes to mind. The Eastern US steel fabrication industry died, and Youngstown went into a death spiral...except somehow, they pulled out. The leaders...the ones that Mr. Frank says wouldn't know what to do...did something right. I think some of their efforts were in the "vibrancy" direction, others focused on city contraction and circling-the-wagons-around-a-last-stand-city-core, and still others on putting together support programs to get tech start-ups to locate there. Then, of course, after they'd already become notable for their resurgence, the steel fabrication industry improbably came back, in the form of sudden massive continuing demand for high quality steel pipe for development of the Marcellus shale fields...for which Youngstown and the rest of the Mahoning Valley, with its existing rusty-but-restorable steel pipe plants, concentration of involuntarily retired, highly skilled steel workers and transportation infrastructure was perfectly situated. So now they're doing much better than a few years ago. Obviously no one would sensibly make a plan for the rebirth of their lost key industry. The other things that the Youngstown people did, though...including some "vibrancy" efforts, I'd guess...do seem to have worked. Youngstown is hardly "vibrant". Yeah, they've lowered their crime rates and unemployment rates, but both are really high. From what I've read about Youngstown, it is about as vibrant as Battle Creek. Calling Youngstown a "turnaround city" after a few better-than-average years is premature. 1. You need decent paying jobs for people with limited skills to attract immigrants and other people from other areas, not "vibrancy". 2. Michigan was the only state to lose population from the 2000 to 2010 Census. Hardly a "vibrant" state. 3. Population is falling in Michigan due to low replacement levels (affected by outward migration, low birth rates and frankly, abortion) of the existing population. This is partly due to the high level of total taxation (at all levels of government) reducing the number of children that can be supported. This is also true in many other areas of the United States. 4. Areas that are growing at least have some jobs that attract people from other areas of the country. But legal immigrants, H1B visas, and yes, illegal immigration, are the only ways some areas are inexplicably growing. 5. Michigan has all the negative factors to population growth, but none of the positive population growth factors. 6. Vibrancy may be just sign of such growth or lack of growth, not the cause or the result of the lack of vibrancy. Man, I've been saying it for years- Flint need new blood- immigrants illegal, legal, refugees, whatever. Folks from Afghanistan, Iraq, Syria, Somalia, and North Korea would be ideal- they are tough enough to handle Flint's thugs. The Land Bank could give property away to immigrants with the provision that it is improved within a certain time frame. While jobs would be needed, many immigrants are self-starters. Look at Dearborn or neighborhoods in Chicago where you have miles of family owned businesses which float the community and few low-paying, low skill corporate run jobs. While profit minded "urbanists" like the Uptown folks and the suburban refugees galivanting around downtown would NEVER support something like what has happened in Lewiston, it is much more realistic and sustainable than their creative class schemes. The entire essay is really good. It does seem to point out that no matter how many new restaurants Flint gets the city is really doomed. If you simply let the patient die of his disease, (abandoning any 'vibrancy-inducing' plans for the city no matter how small or permanent), then the only thing you're guaranteed of is a lifeless corpse. But if you hook the patient up to life support, (new restaurants and the like), then the patient will at least still be breathing, albeit shallowly, and able to take advantage of the cure whatever it may be, when it is eventually found. 1. One or more universities. College-age people are essential. 2. Resident students. Commuter students don't contribute to vibrancy. 3. A mix of undergrad and graduate-level academic programs. Synergism between creative/communication/marketing types on the one hand, and graduate-level engineering/science/management types on the other, is essential to formation of an entrepreneurial/start-up/exciting-places-to-work economic culture, which is almost a lock to result in vibrancy. 4. Enough jobs. Unemployed people can't afford to contribute to vibrancy...at least not for long. 5. Not too much focus on physical manufacturing, heavy industry and ordinary jobs. People with jobs of these kinds mostly don't contribute to vibrancy...they have to get up early to go to work, and between work, home and family they're usually overloaded. They watch TV instead. We've got #1. We're weak on #2 and 3, and we fail on #4 and 5. 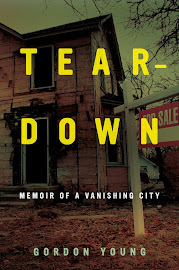 The Flint area will continue to decline as the current life blood to the area are retired GM workers. As they die off, the significant money their pensions and health care contribute to the local encomony will go with them. We have yet to see the bottom of this hole. Here's the way to get Flint's "vibrancy" back.........get those 80,ooo (!) GM jobs lost since the late 70's to return. Good jobs= money to burn= vibrancy. Simplistic but, unfortunately, true.